Take 101 to Willow Road east. Turn right at the first light on to Newbridge. Go to the end of Newbridge. Veer left on to Bay Road at Ralmar Ave.
Take 101 to University Ave. east. Stay in the middle lane as you come off the freeway. This lane will make a left turn onto Donahoe, and then you should take an immediate right onto University Ave. The field will be on your right in about 4 blocks. Parking is on the street for regular season games and enter through the gate at the corner of Dumbarton Ave. and Bay Rd. Tournament parking is in the school parking lot at the end of Ralmar Ave. No dogs allowed on school property! Also, no smoking or alcoholic beverages. No food is allowed on the Rich May Field. Sam Trans Bus 281 provides service between Kelly Park in Menlo Park, and Cesar Chavez sch0ol. Go to the end of Newbridge. You will reach an intersection where Bay Road joins at an angle. Take a hard left onto Ralmar Ave.
Go to the end of Ralmar. It will curve into the parking lot of the school. The gym is on the far side of the parking lot. 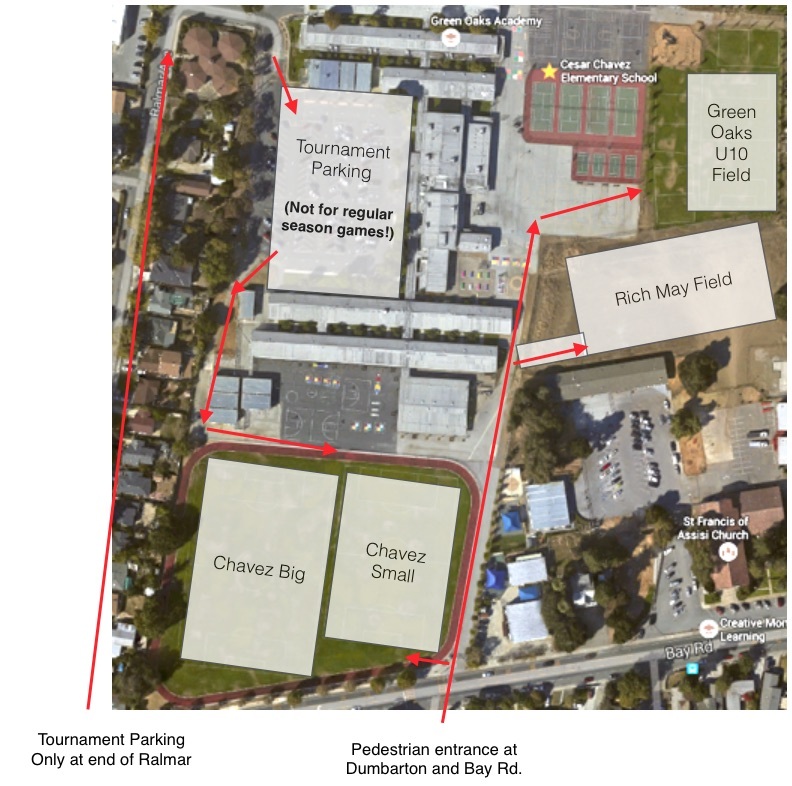 Pass the school's field on your right, then take your next right onto Ralmar Ave.
BCM is located at 1001 Beech St. in East Palo Alto, and is between Clarke and Pulgas Ave.
Take your first left onto Bayfront Rd. Turn right at the 2nd light onto Pulgas. Turn left at the 3rd stop sign, on to Beech St. The driveway will be on your right across from the Seventh Day Adventist church. Take Bay Rd. east towards University Ave.
Cross University Ave., and take your next right at Clarke Ave. In about half a mile, take a left on to Beech St. The driveway will be on your left, across from the Seventh Day Adventist church. RYAA is a 501(c)(3) non-profit corporation.